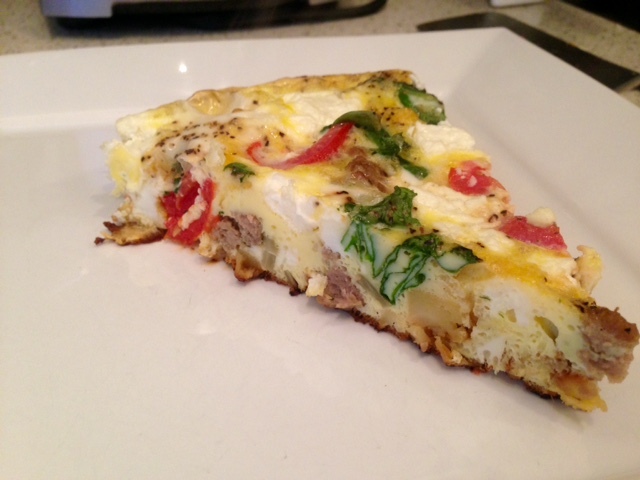 Guys, why have I never thought to put meat in a frittata?? What is wrong with me??? 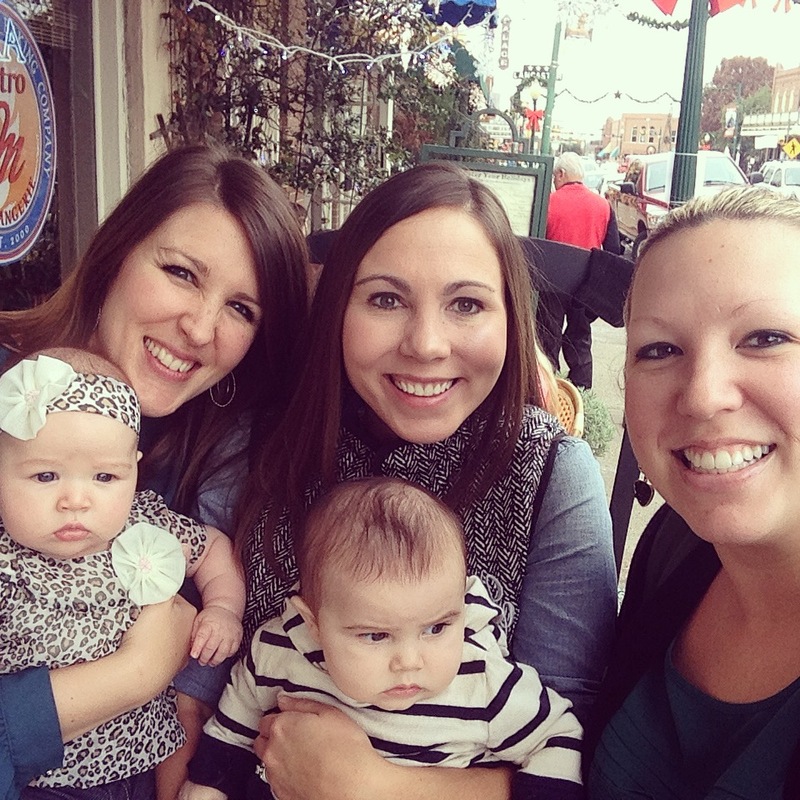 The day before, Kristine and I had a girls’ brunch with some other friends at her house. We didn’t want to go to a ton of trouble, but knew we’d all be starving so we needed to make hearty food. We also needed to make sure it was dairy-free since dairy seemed to upset the baby…and that does limit things a bit. 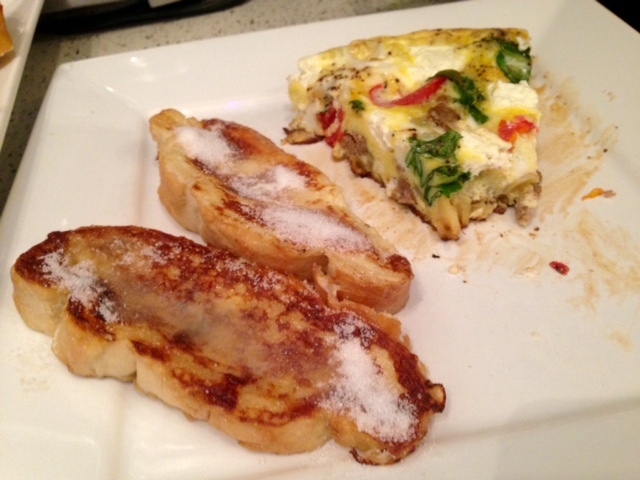 Finally we settled on French toast (with almond milk) and a frittata with goat cheese, which was deeeeelish! We basically made a “kitchen sink” frittata, meaning I cleaned out her fridge of veggies and just threw them all in there. The surprise in this, besides the turkey sausage, is the parsnips. I feel like parsnips don’t get enough love. They’re sweeter than a potato, milder than a carrot, and easier to prepare than a turnip (ugh, peeling turnips is the worst). When sauteed or roasted, they caramelize into this delightfully nutty sweet crunchy awesomeness. We had some extras in the fridge because we made my shepherds pie with goat cheese carrot parsnip mash (amazeballs) the night before. 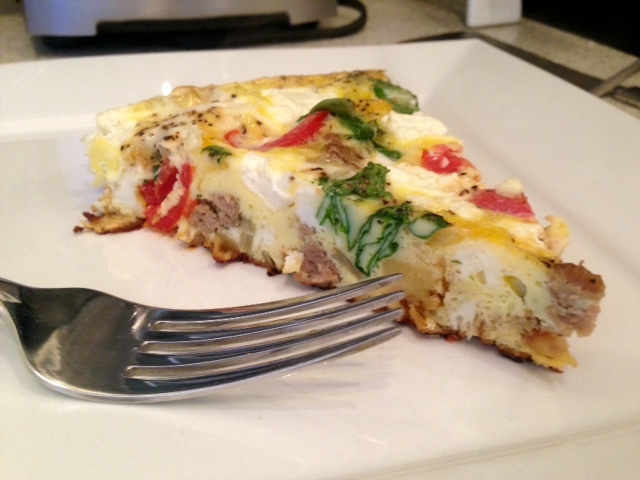 I used the parsnips and onions as the base or “crust” of the frittata, then we also piled in more onions, spinach, and tomatoes, as well as the goat cheese and turkey sausage. Preheat the oven to 400 F. Heat an oven-safe skillet (I used cast iron) on medium-high and add a tablespoon of oil. Add the turkey sausage to the pan and begin browning it, chopping it up. Dice up half of the onion and add to the sausage. 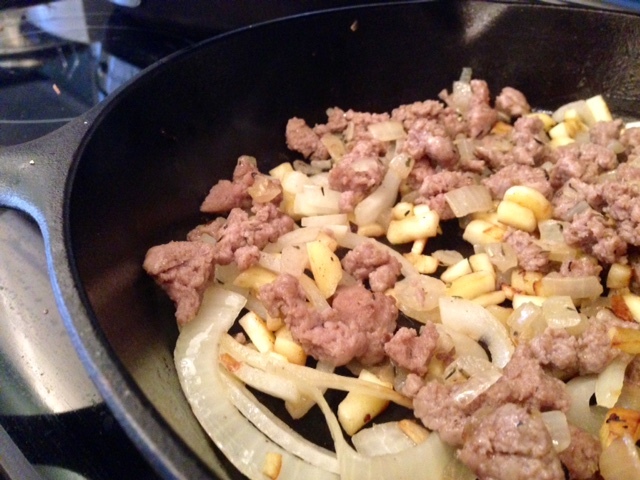 Continue to cook until the sausage is totally browned, then dip the meat and onions into a bowl and set aside. 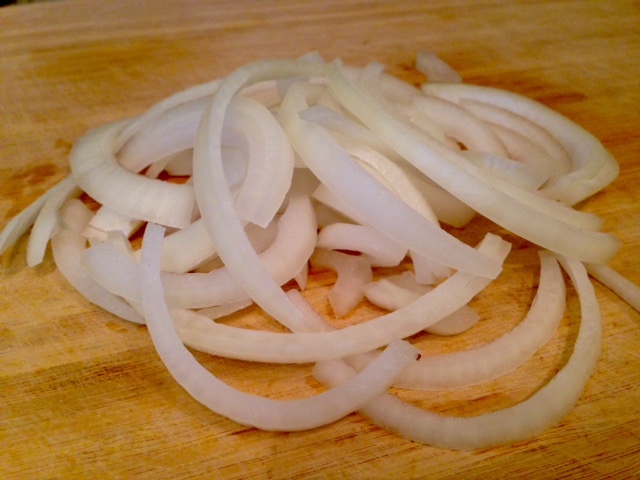 Slice up the other part of the onion, and add to the pan (on medium heat). 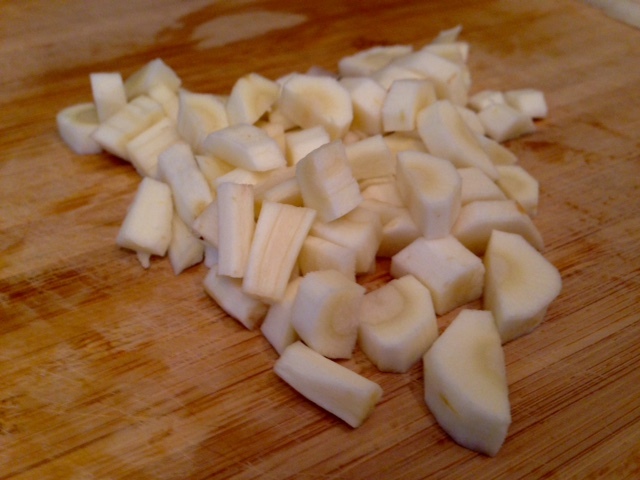 Dice up the parsnips into small pieces (so they’ll cook fast), and add to the pan. (Not pictured: the onions. Trust me, they’re still there). Cook for a few minutes, until the parsnips soften. Then add the meat and onions back to the pan. 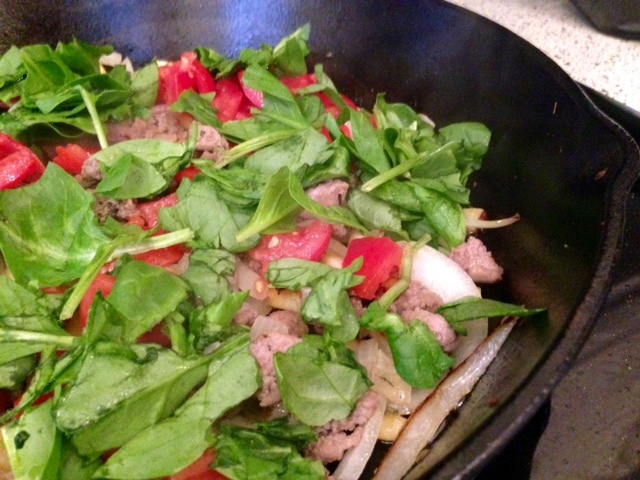 Dice up the tomatoes and roughly chop the spinach, and spread both evenly in the pan. 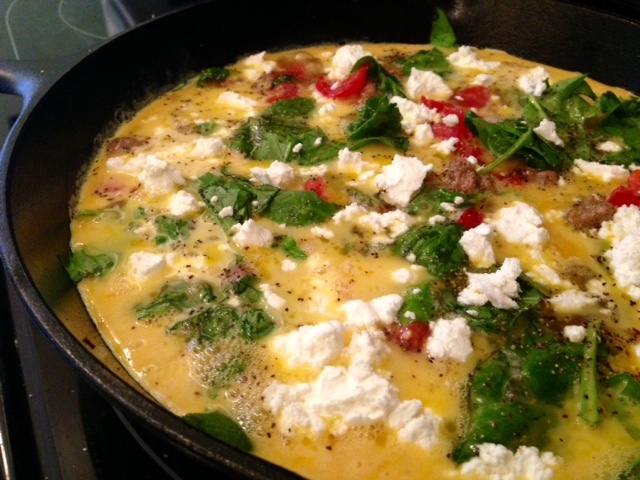 Beat the eggs (with a tablespoon or two of milk, if you’re not avoiding dairy) and pour over into the pan. Season with salt and pepper. 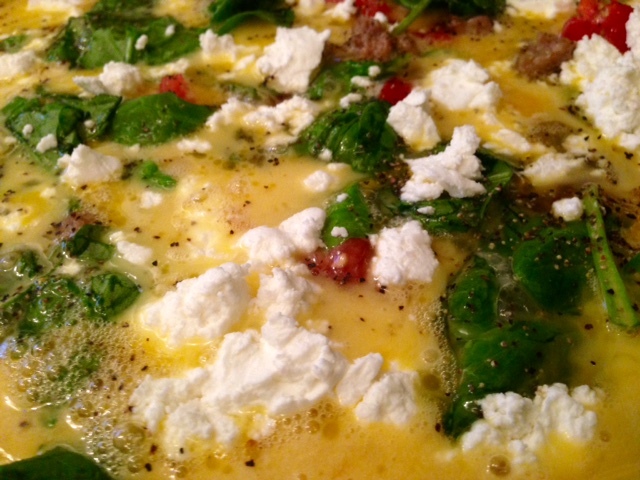 Break your goat cheese into small pieces and sprinkle evenly throughout the pan. Cook on the stove for about 5 minutes, until the eggs start to set up, then transfer to the oven and bake for another 15-25 minutes, until it’s not runny anymore. Let it set for a few minutes, then serve. It makes awesome leftovers and breakfast at work, and keeps for 4-5 days. 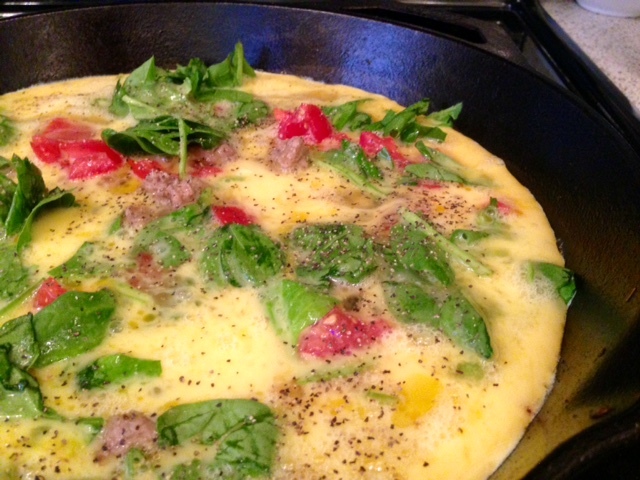 Heat an oven-safe skillet (I used cast iron) on medium-high and add a tablespoon of oil. Add the turkey sausage to the pan and begin browning it, chopping it up. Dice up half of the onion and add to the sausage. 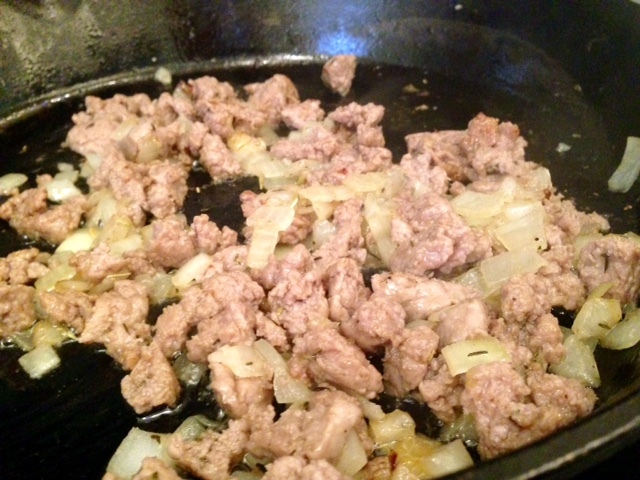 Continue to cook until the sausage is totally browned, then pour the meat and onions into a bowl and set aside. 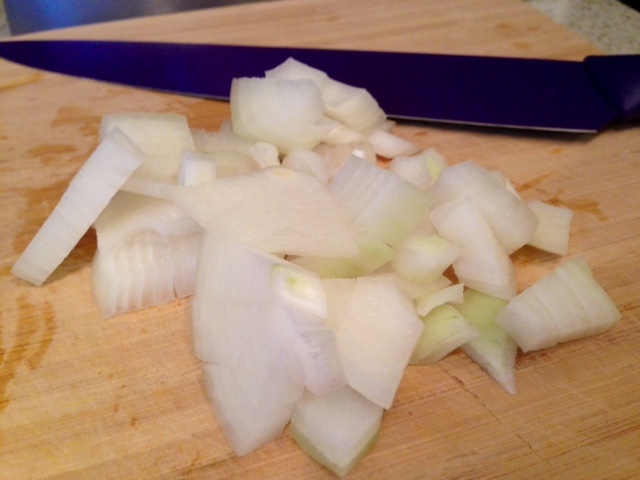 Slice up the other half of the onion (like you would for caramelized onions), and add to the pan (on medium heat). 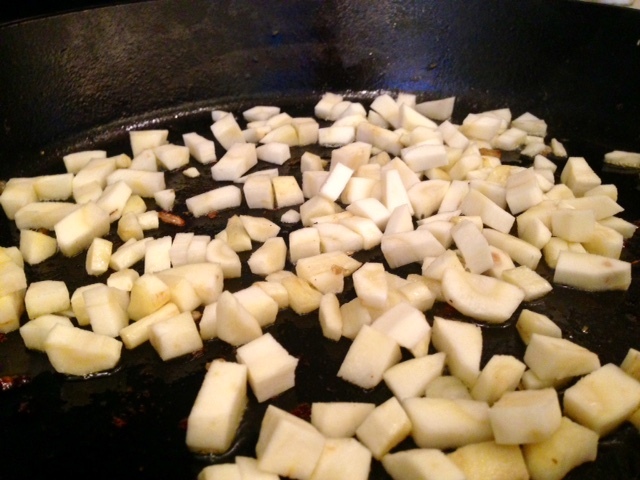 Dice up the parsnips into small pieces (so they’ll cook fast), and add to the pan as well. Cook for a few minutes, until the parsnips soften. Then add the meat and onions back to the pan. Dice up the tomatoes and roughly chop the spinach, and spread both evenly in the pan, cook for a minute so the spinach wilts. Beat the eggs (with a tablespoon or two of milk, if you’re not avoiding dairy) and pour evenly into the pan, then season with salt and pepper. Break your goat cheese into small pieces and sprinkle evenly throughout the pan. Cook on the stove for about 5 minutes, until the eggs start to set up, then transfer to the oven and bake for another 15-25 minutes, until it’s not runny anymore. 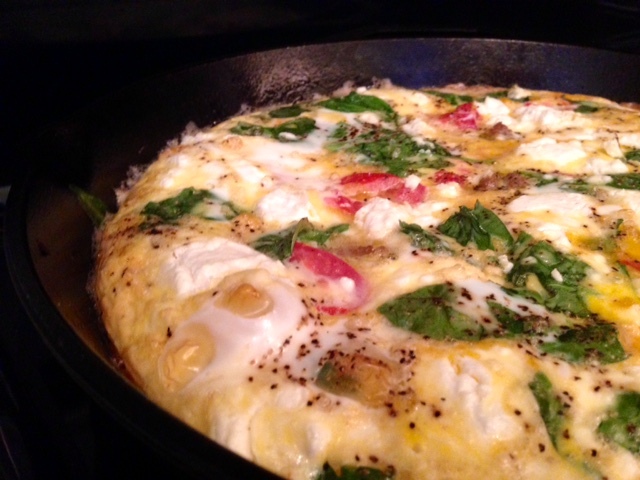 Let the eggs set for a few minutes once you pull it out of the oven, then serve. Keeps well in the fridge for 4-5 days.